In a large bowl, using an electric mixer, beat the cream cheese, butter, orange zest, sugar, egg yolk and vanilla extract until light and creamy. Sift in the flour and combine until a smooth batter is achieved. Fill a large piping bag with a 1½ inch star tip and pipe the stars spacing them about 2" apart. Place in a preheated oven for 20 minutes until golden, remove from the parchment paper using a spatula and place on wire racks to cool down. 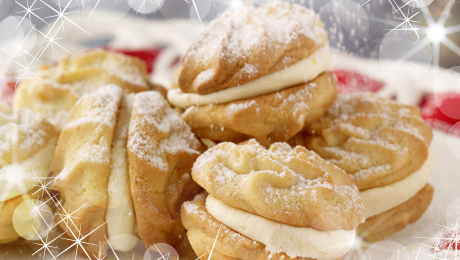 To make the cream filling, beat the butter, icing sugar, orange zest and juice until smooth. Place half the biscuits upside down, then spoon a teaspoonful of filling onto each. Place another biscuit on top then press down gently. Place in a cool place until set, then dust with icing sugar before serving.